Ordinary Football Fan? Worried what info the police hold on you? As James Kelly’s bill for the repeal of the Offensive Behaviour at Football and Threatening Communications (Scotland) Act 2012 has gathered momentum behind the walls of Parliament, it is regrettable that Police Scotland’s campaign of intimidation, harassment and victimisation of football supporters has not subdued. Fans Against Criminalisation deem the conduct of the police in Perth before, during and after last Sunday’s match between St Johnstone and Celtic to have been entirely unacceptable. Indeed, the aggressive mixture of nakedly violent policing tactics and the Orwellian surveillance of fans should be a cause of concern for us all. Having reviewed the evidence available from the day’s events, we have now concluded that Police Scotland deliberately set out to incite disorder, and we fear that the police may adopt similar tactics once again at future fixtures in their attempts to demonise football supporters in defence of the Offensive Behaviour at Football Act and the generous budget which comes with it. We call on all fans to remain vigilant at matches, to ensure that they know their rights if approached by officers and to continue the fight to end this harassment. 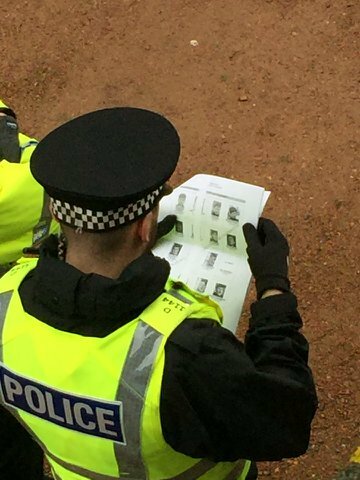 One particularly troubling aspect from the weekend was the picture which has surfaced showing a Police Scotland officer holding a paper sheet, appearing to be looking over a series of pictures of fans faces. Previous Previous post: Scottish Government include the Offensive Behaviour Act in Review of Hate Crime!